EMTP-RV uses state-of-the-art algorithms and unique techniques such as MANA (Modified Augmented Nodal Analysis), iterations to solve non-linearity and sparse matrix solver. From electromagnetic to electromechanical transients, calculations are lightning fast regardless of the size and the complexity of the power system. Moreover, EMTP simulations are super easy to configure and don’t require external compilers. 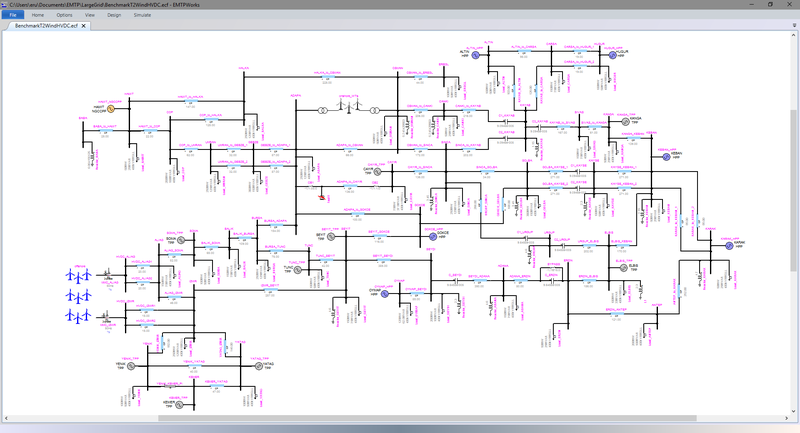 Example of a large power system simulated in EMTP (more than 20000 devices). Model includes HVDC converters and wind turbines. EMTP-RV includes a comprehensive library of control blocks and a cutting-edge control system solver. For improved numerical stability, numerical delays due to nonlinear feedback loops are eliminated using advanced algorithms. Additionally, it is possible to import Simulink® models in EMTP using the EMTP Simulink Toolbox (LINK). 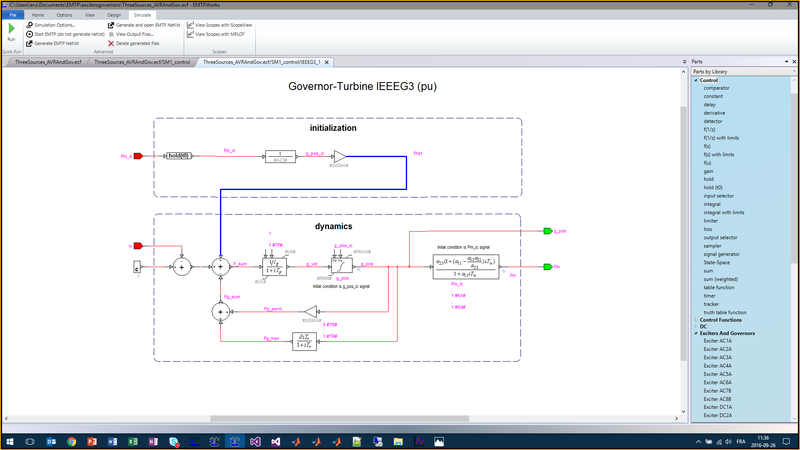 IEEEG3 Governor control system model. Control system is automatically initialized from steady-state and load-flow results. 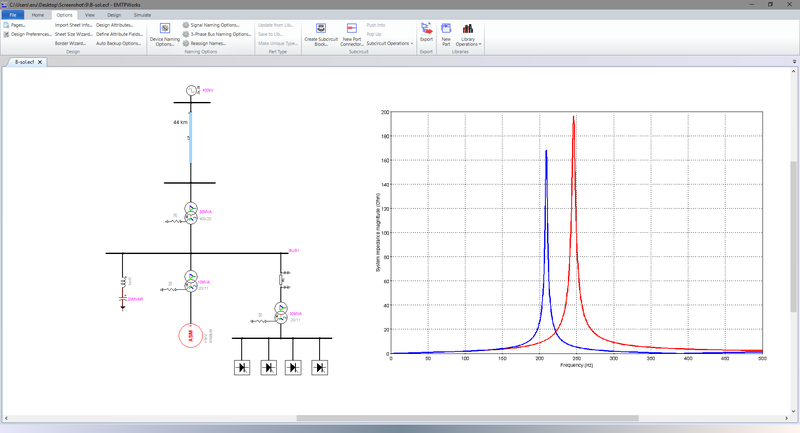 EMTP includes a multi-phase and unbalanced Load-Flow solver. 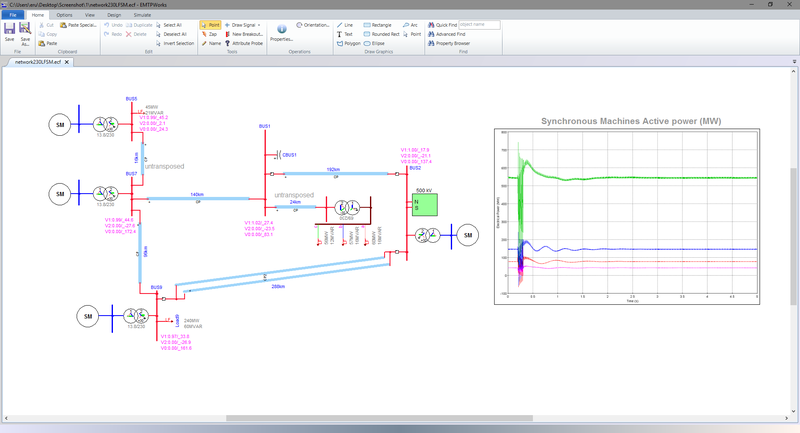 Load-Flow can be used to start time-domain simulation directly in steady-state. Network state variables and machine controls are automatically initialized even when the network includes unbalanced transmission lines or unbalanced loading. Multiphase load-flow constraint data is entered using specific Load-Flow devices and is layered over the network simulated in time-domain. Any network can be augmented with Load-Flow devices without any other manipulations. The main purpose of the steady-state solution in EMTP is to initialize the network state variables for minimizing the natural response at start-up in time-domain. When available, the steady-state is based on the load-flow solution. In frequency scan, all source frequencies are varied using the given frequency range and the network steady-state solution is found at each frequency. Frequency scan can be used to determine system resonance and to design harmonic filters. Example of frequency scan results. The system input impedance at the PCC of an industrial plant is calculated from 0 to 500Hz.